Tip number 1: Have nothing of importance to say and whatever you say should be idiotic and wrong. Lest people see what you are saying is unimportant, idiotic and wrong, you must never communicate it clearly. Write meaningless Gibberish. Tip number 2: Avoid those who are adept at using Occam's Manure Fork. …a new paradigm of power is realized which is defined by the technologies that recognize society as the realm of biopower. In disciplinary society the effects of biopolitical technologies were still partial in the sense that disciplining developed according to closed, geometrical, and quantitative logics. Disciplinarity fixed individuals within institutions but did not succeed in consuming them completely in the rhythm of productive practices and productive socialization; it did not reach the point of permeating entirely the consciousness and bodies of individuals. They follow tip 2 by having it reviewed by credulous fools, such as Emily Eakin in The New York Times, who thought the book was: "...filling a void in the humanities." Roger Kimball, in his piece in The New Criterion, The new anti-Americanism, replied to that little gem of a comment with: "It would be more accurate to say that it epitomizes that void." Precisely. These people couldn't think their way out of a paper bag. Antonio Negri was an architect of the infamous Red Brigades, a Marxist-Leninist terrorist group. In 1979, he was arrested and charged with "armed insurrection against the state" and seventeen murders, including the murder of the Italian Prime Minister Aldo Moro, who was kidnapped in 1978 and shot dead fifty-five days later, his body dumped in a car. Negri did not actually pull the trigger. But, as David Pryce-Jones noted in an excellent article about Empire in the September 17 number of National Review, "The Italian authorities had no doubt that Negri was ultimately responsible. Just before Moro was shot dead, someone telephoned his distraught wife to taunt her, and that person was identified at the time as Negri." He fled to Paris, where he struck up friendships with Michel Foucault, Jacques Derrida, and other specimens of enlightenment. He eventually returned to Italy and negotiated a sharply reduced sentence for "membership in an armed band." 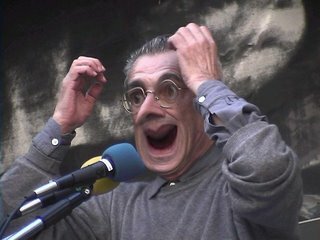 A delightful man, this Italian Political Philosopher. I imagine the photo of him above will be what he looks like when he (no doubt) finds out he's won the Nobel peace prize. Technorati Tagged - Fallacy, Skepticism, Gibberish, Post Modernism.